Climbed Mountaineer's Route on Saturday 10/20. Departed from Portal at 3:30a, Summit at 11a. Trail was clear of snow up to the chute. Some snow in the chute but ultimately no additional gear was required, just some extra care in the snow/scree mix. We had crampons but never pulled them out. Microspikes were beneficial on the first 80 of the 99 switchbacks on the way down. Also, flowing water on all water crossings. I might be there on 11/3-4 backpack. I’m going to be attempting a solo summit this Friday at 4 am (maybe earlier) and was wondering if anyone would let me join their crew? Or even just follow from behind. I realize it’s asking a lot and also very last minute. I’ll be attempting either way but would rather go up with others. Suppose to have 5 friends join me but they all bailed because it’s gonna be a little chilly and and they didn’t train that hard. If you got room for one more then I’d really appreciate it! 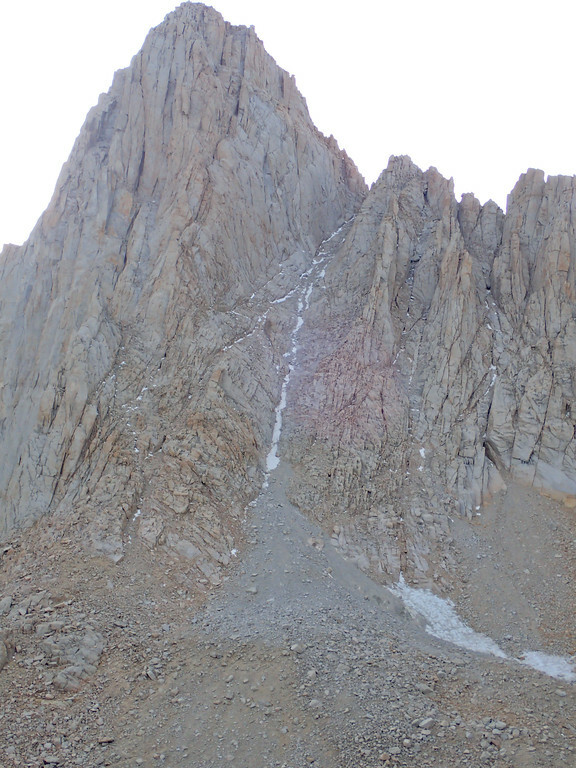 We're planning to do mountaineering route on 10/27 - how was it from the notch to the top? Did you go the class 3 way or take the way around? Also looking for conditions for the mountaineers route. We'll be there next weekend. The mountaineers route? but then you mention the switchbacks, I think the mountaineers isn't optional at this time. For day hike, you can do MR up, main trail down. Maybe that was Chris did. Anyone make it up the mountaineers route last weekend? I did the Mountaineers Route solo on Sunday 10/28. I went up the MR and down the Main Trail. Left the Portal at 4:55 am to warmer than expected temps. First sign of any ice on the route was on the big slabs between Lower Boyscout Lake and Upper Boyscout Lake. The ice was mostly avoidable through this section, but I threw on microspikes for a quick second at one spot where I had to cross the water/ice flow line. 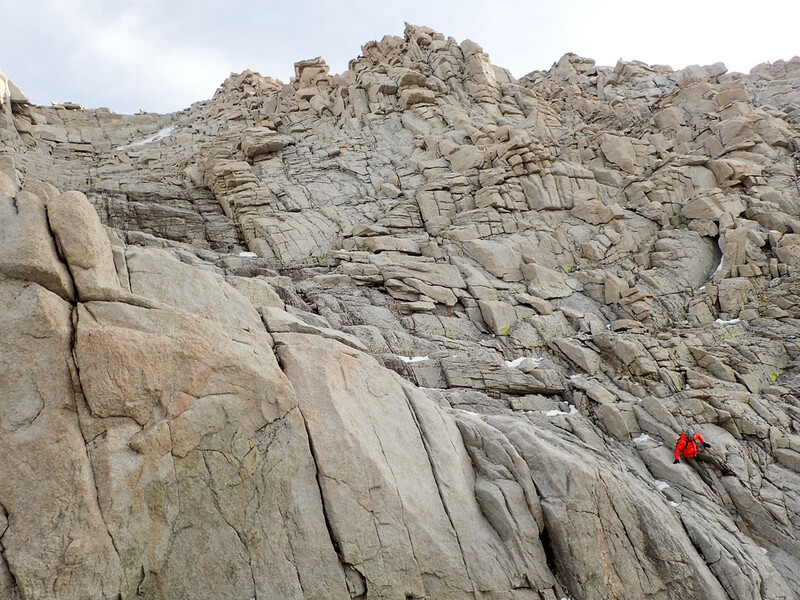 Other than that, the route was clear and dry until the Chute. The Chute had a few big patches of snow in the middle. It was mostly avoidable, and when I did need to cross it, it was soft enough to kick steps with just my boots. I carried ice axe and crampons, but ended up not using them, because the snow was soft enough and the snowy sections didn't seem big enough to necessitate a transition. Trying to avoid the snow made routefinding a little more challenging, but not much different than finding an optimal line in any other conditions. I would still strongly recommend carrying ice axe and crampons on this route, because they may be necessary if the snow hardens at all this week. Once I hit the notch, the wind from the west hit really hard. I decided to go up the first gully. There were some visible patches of snow and ice, but I thought it looked dry enough to safely avoid those. As I climbed this section, I came across a few more hidden patches of snow/ice, so routefinding became a little bit challenging. There were a couple spots I had to downclimb/reroute, because my chosen line ran into an ice patch or a climbing move I wasn't comfortable with. With some patience it was certainly passable, and I made it to the summit at 11:40 am. There were about a dozen other people on the summit. I passed by five others on the MR, but they were going slower and I'm not sure if they summited. The summit was windy, but I was comfortable in just a fleece with gore-tex shell, and hat/gloves. I departed the summit at 12:10 pm. I decided to take the trail down, since the ascent was a little more demanding mentally and technically than I expected, and I didn't want to downclimb the route solo with the snow/ice patches. Between the summit and trail crest, I passed two dozen or so others on their ascent. The trail was mostly dry in this section. There were a couple icy spots, but they were avoidable by walking on the rocks. From Trail Crest down through the upper north-facing switchbacks, the trail was covered in hard-packed snow and some ice. Traction devices are definitely necessary in this section. I used YakTrax, and had a couple icy spots where something a little more aggressive would have been more comfortable. The trail became dry where the switchbacks become more east-facing. After a long and steady descent on the trail, I reached the Portal at 4:25 pm. From notch, did you take a look at the condition of the death traverse or easy walk-off? The "easy walk off" looked to be at least half snow covered. There were definite footprints through it. It's looks like there are intermittent dry spots, and like it would be passable depending on the snow conditions. Thank you!. It's very helpful! We hiked Mt Whitney via MR last weekend (11/3-11/4). Camped at UBSL on Saturday. On Sunday, summited via MR, came down same way, then back home. The route condition is pretty much same as @Chris and @bruckbau descriped. (Thank both!). We carried crampons, ice axe and microspike, used microspike twice very briefly on slabs between LBCL and UBSL, nothing been used in Gulley and final 400. Now waiting for snow season. Final 400 was easily descended picking our way down the most solid rock away from the little snow and ice there is. - Switchbacks have some sections covered with hard snow. Microspikes were perfect to zip through this section. - Trail crest was almost snow/ice free. We did not use microspikes there. We had an ice axe and a helmet - but did not use them. Shared on FB by Karen L. From Sunday, Nov 11. Somebody know the lake is frozen ? Can anybody advise about the current trail condition of Whitney main route? I am going to go at this Saturday, 12/22. 1. Whitney portal road actually blocked with fence? USDA indicates the status of closed. 2. Snow at outpost camp and upper trail camp: Should I bring snowshoes? or just crampon? Generated in 0.277 seconds in which 0.266 seconds were spent on a total of 15 queries. Zlib compression disabled.